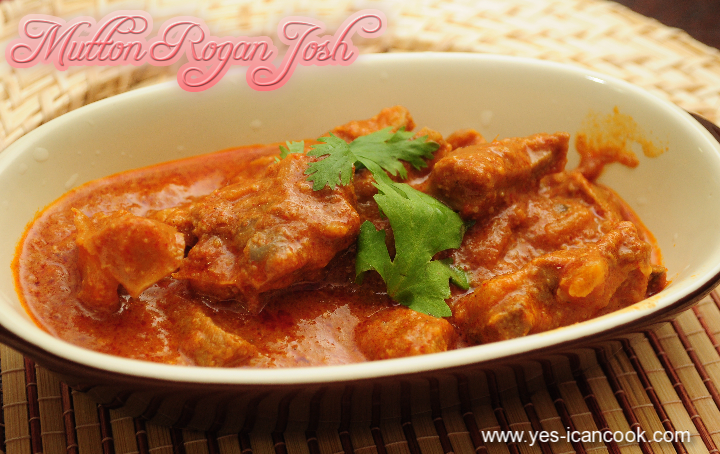 Mutton Rogan Josh is a recipe that is found on the menu of almost every Indian and Asian restaurants. 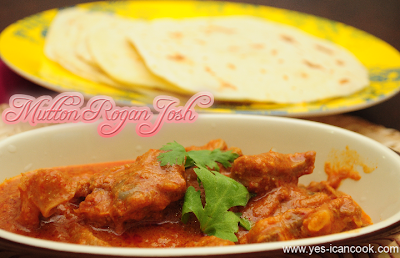 With some mutton to be cooked and the desire to explore new recipes to try I thought for sometime and decided to look for Mutton Rogan Josh. I got to know that Mutton Rogan Josh is of Kashmiri origin. How many of us know or knew that? I went about to search for authentic recipe to prepare Mutton Rogan Josh but every recipe that claimed to be authentic was proved wrong by comments from readers. I looked and browsed through several recipes then came up with this recipe taking a bit of one recipe and a bit of another recipe. The outcome was delicious. We loved it. I made them with some flour tortillas. 1. Wash and clean the mutton well. Discard all the water. 2. In a mixing bowl add the mutton, 1 Teaspoon of ginger garlic paste, 6 Tablespoons of yogurt, salt to taste and mix well. Keep it aside for about 30 minutes. 4. Add peppercorns, Bay leaf, cinnamon stick, cloves and cardamon and fry for a minute. Add asafoetida. 5. Add the sliced onions and fry till they just start to brown. 6. Add the remaining ginger garlic paste and fry for a minute. 7. In a small saucepan bring 2 cups of water to a boil. Keep aside. 9. Add 1 1/2 Teaspoon of red chilli powder and mix well. 10. Add the boiled water mix well cover and cook the mutton on medium low flame till the water evaporates. This takes about 30 minutes or more. Keep checking every few minutes. 11. Check if the meat is cooked if not add more warm water, upto 2 more cups and continue to cook. You can pressure cook the meat too which will reduce the cooking time to a large extent. I chose to cook without pressure cooker. 12. When the meat is almost cooked, add the remaining kashmiri chilli powder, coriander powder, fennel powder and mix well. Add sugar to add a sweet twist to this spicy gravy. 13. Add the remaining yogurt and mix well. Cook for 15 minutes on low flame. 14. Adjust the gravy consistency as desired by adding water as required. 1. Kashmiri red chilli powder is used to give the red color to this recipe. 2. Reduce the amount of water if cooking in pressure cooker. 3. Whisk the yogurt before using to avoid lumps of yogurt.